This of course has to be improved. 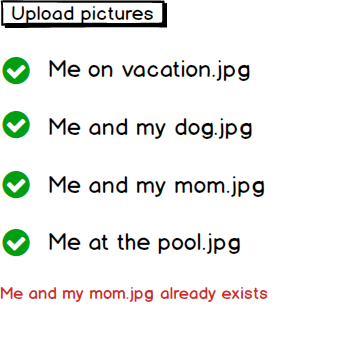 There should at least not be a green check-sign if the picture already exists. But is there a way to prevent the error? I don’t want the user to make the error in the first place, and absolutely not having to correct it himself. How about the approach in Windows and OS X when copying files/folders? 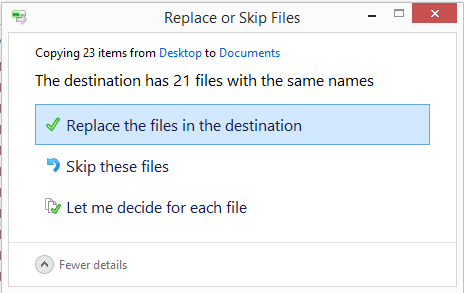 Validate before the file is uploaded, and give the option to the user what they want to do with duplicates: replace, skip, or rename/keep both. In general, in any validation process, the validation should be taken before the action performed. So, you have to check for file existence before uploading process, then cancel the upload for the existing file and notify the uploader. Not the answer you're looking for? Browse other questions tagged error-message error-prevention or ask your own question. Should I show the Bank name as a user enters a routing number? Can text area be used as error/warning/notification output? Can errors be too simplified/generic (even for non-technical users)? What is the best way to convey duplicate content or task already exists message?